This event held on 2nd May 2010 was aimed mainly at potential Jed’s and SAS troopers in preparation for the Comrades in Arms ‘Operation Jedburgh’ July event but German players were welcome too. It was designed to give players a taste of what to expect and a grounding in some basic skills that they would find useful to get the most out of the event and to keep going if the weather was against them. It was also suitable for anyone looking to learn/brush up on some skills for future events. Campcraft – Shelter building, track plans, firelighting, light & noise discipline, concealment. 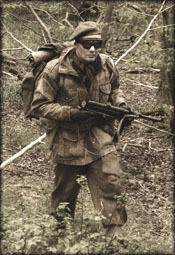 Movement – Small unit tactics, hand signals, patrolling, “jungle lanes”, breaking contact. Selfcare – Feet, warmth, motivation. Basic navigation – Compass bearings, grid references, pacing. Signals – Basic radio procedures. Also, to teach that “living in the field” doesn’t equate to “suffering for no reason”. You can be perfectly comfortable, warm and well fed, without having to resort to eating nettles and worms! In fact, if you’re living like a tramp, you’re doing it wrong! It was both challenging and rewarding for the participants and paced so as not to kill anyone with fatigue. It definitely wasn’t a stroll in the woods or a glorified social. Learned so much, and I will be whittling down my kit even more for the real event. My nettle rash / bramble thorns are throbbing, but I’m alive! A.K.